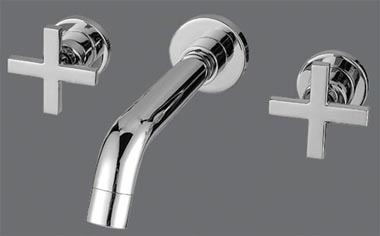 The Concord is a contemporary bathroom single sink vanity set that embraces the latest trend in luxury modern bathroom design. 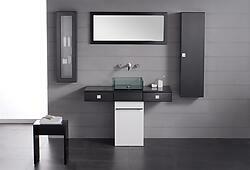 This beautiful single sink modern bathroom vanity set is ideal for any size bathroom. Its unique style captivates its extraordinary elegant modern feel. A spacious rubberwood countertop captivates the vanity's elegant modern appeal. The countertop, featuring 2 drawer compartments, allows for plenty of flexible storage. 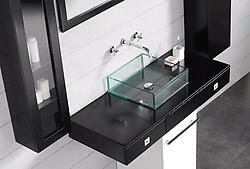 Similarly, the 2 wall-mount side cabinets extend the storage capabilities of this wonderful modern bathroom vanity. The rectangular form of the vessel sink offers a long flat basin; when filled, it offers the serenity and beauty of a reflecting pool. It is a wonderful basin that creates a Zen-like water feature. The large matching framed mirror cultivates an overall ultra-modern appeal.